This was the perfect place for myself & family to explore Rome. This apartment is in a fantastic location & is exactly as described. Only 5 minute walk to Vatican City & metro. Plenty of room for the six of us & having 2 bathrooms was very convenient. Silvana was a great host & very welcoming. Thank you Silvana! Very comfortable apartment, In a great location. When the reviews are honest they can only please me. Thank you. Too bad I didn't recognize the fifth star considering my availability in everything. This was one of the nicest holidays we have ever had. The apartment is well situated and nicely decorated and had everything we needed. The area was lovely and very convenient for travelling all around Rome. There is a subway near by, a very good supermarket and some lovely local restaurants as well. Every thing that could have been done to make our stay memorable was: Silvana is a wonderful and very thoughtful host - and the cakes she bought us were lovely! I would highly recommend this apartment and hope one day to return again. This review as so many others gratifies all my efforts to give the best to my guests. This beautiful family has spent their holiday in Rome to celebrate the birthday and I could not be indifferent and that's why I gave her the cake. It will remain a good memory of them. We had a great time at the apartment. It was functional, clean and had great design touches. Silvana was helpful and got us a crib for a baby. The kitchen had everything we needed. We also really liked the central location. Vatican is a few minutes away. There is a metro station nearby and many shops. Even though it’s in a lively area, the apartment is quiet. Grazie mille! Thanks to you for choosing my apartment, it was a real pleasure to host you for your correctness, punctuality and sympathy. I hope to see you again. 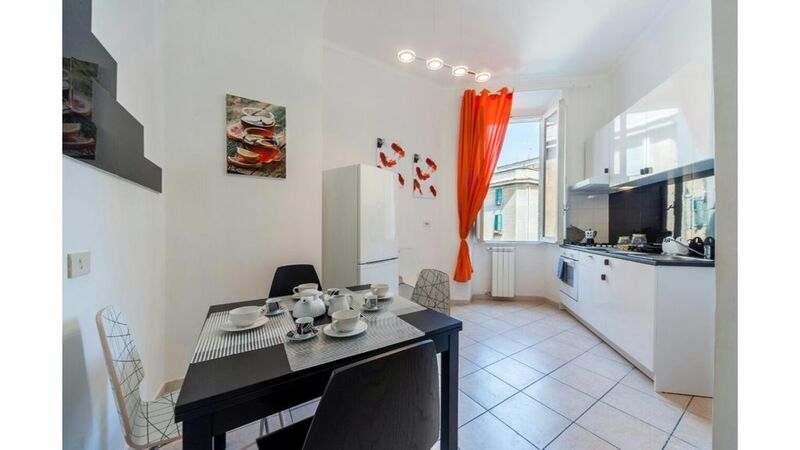 We found this apartment to be perfect for 2 couples exploring Rome. Silvana was very helpful with suggestions for dining and arranging taxis. Staying here is an authentic Italian experience. Very welcome, correct and punctual guests. It was a real pleasure to host them. We were a group of 7 and there was plenty of room for all of us to stay comfortably. This is a good location close to grocery stores, restaurants and easy access to the sub way. We were able to navigate around Rome very easily. The hostess was very gracious and helpful. This was a great place for us to stay in Rome. I am very glad that you enjoyed my apartment for what it really is and my availability to my guests who are for me considered as family members, as dear friends. Thank you, you have been impeccable guests, I hope to see you again once again. Thank you!!!!!! A practical and convenient stop for tourists, or residents, who want to get from the Fiumicino airport to the Vatican and in the Prati area, exists in Rome. In fact, for some time now the shuttle bus has been stopped for all those people who have taken the hotel or accommodation in the Vatican area and that by doing so they do not necessarily have to pass through Termini station and also take the metro. The Rome Fiumicino airport serves several domestic and international flights, knowing how to reach it is therefore very important if you are in Rome.